Getting off the plane at the Palma de Mallorca Airport gave me a rush of exhilaration and joy. There’s nowhere on earth I feel more at home than by the ocean: the humid, salty air; the slight breeze coming off the water; the dependable sunshine and palm trees that speckle the landscape. For the last four months I’d been adjusting to life in a small town in northern Holland – and in the winter no less. The sun set around 4:30pm, with temperatures ranging from around freezing to a high of about 45 degrees F / 7 degrees C. For an American girl used to living at the beach in South Carolina (= hot and humid with mild winters), the contrast was an abrupt change. Enter the Balearic Islands (‘Islas Baleares’ in Spanish), just off the east coast of Spain in the Mediterranean Sea. There are three major islands – Mallorca (Majorca), Minorca and Ibiza, with many minor islands scattered around these three dominant ones. 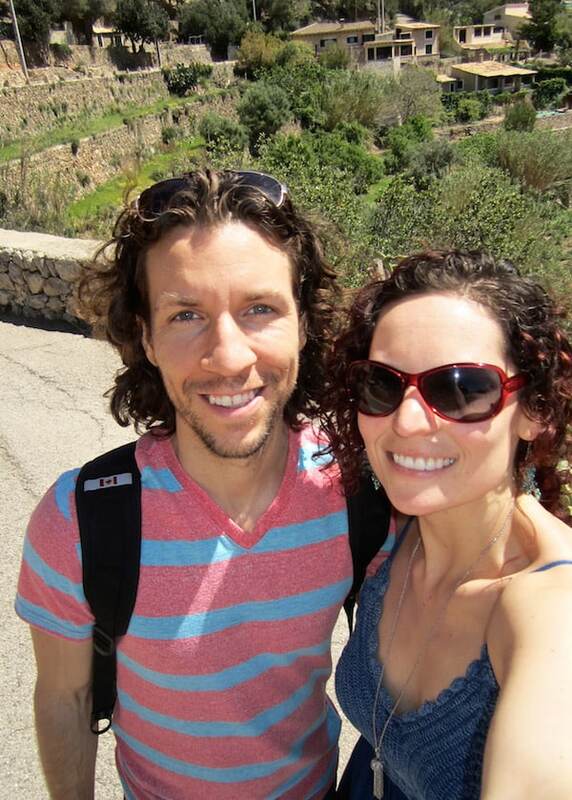 Finding myself in Mallorca in April, plopped into a Mediterranean island climate, made my heart sing. 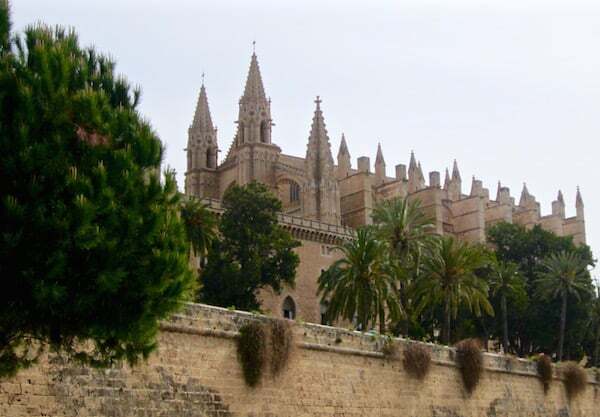 Palma is the capital city of Mallorca. It’s lively. It’s warm. It’s vibrant and colorful. 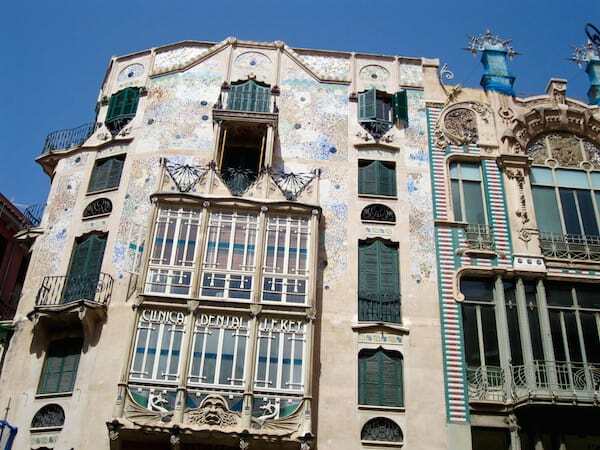 Like most Spanish cities, Palma has a discernable pulse that beats through its inhabitants and the local way of life. Many shops close in the afternoon for siesta (a midday rest common in this part of the world due to the hot weather), and people seem to not eat dinner until between 9 and 11pm. What brought me to Palma? 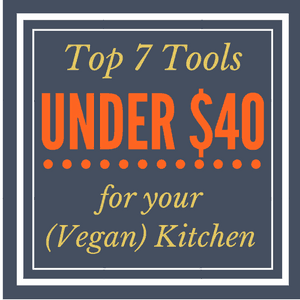 At that time I hadn’t yet started this food blog, but I knew I wanted to move in the direction of sharing my love and passion for vegan food. 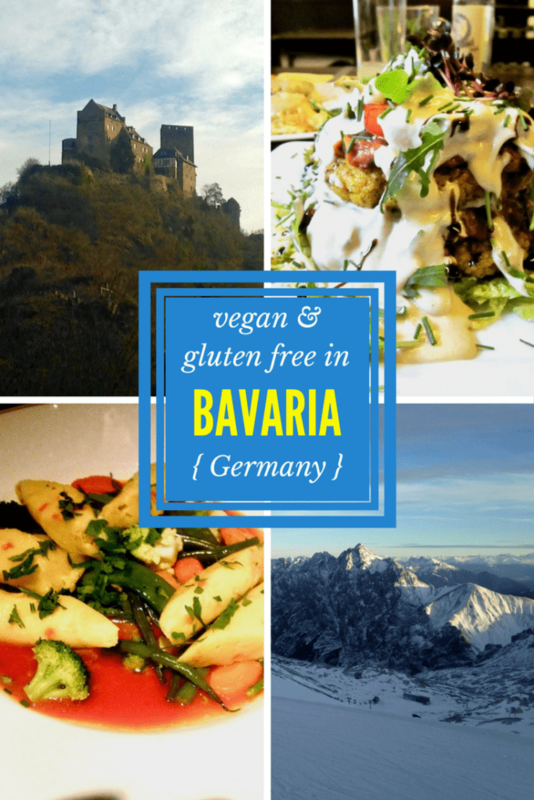 I was eagerly looking for vegan cooking classes in Europe, because I had the feeling that getting in the kitchen and being immersed with other like-minded people would support me in getting clear on my next steps. Plus, I love cooking (and eating! ), so knew it would be fun to branch out and learn some new skills in this area. Here are the places I had the pleasure of dining. I hope you find this useful and inspiring for your next travel adventure! Bon Lloc prides itself on being the first vegetarian restaurant to open in Mallorca, way back in 1978! The restaurant is now exclusively vegan, and sources local and mostly organic foods, using fresh ingredients brought daily from the market. The focus is on tapas, which are small dishes that you can eat as an appetizer or combine to make a meal (you’ll see tapas everywhere in Spain). I love tapas because I enjoy variety and getting small tastes of many different dishes, and they’re great for sharing. 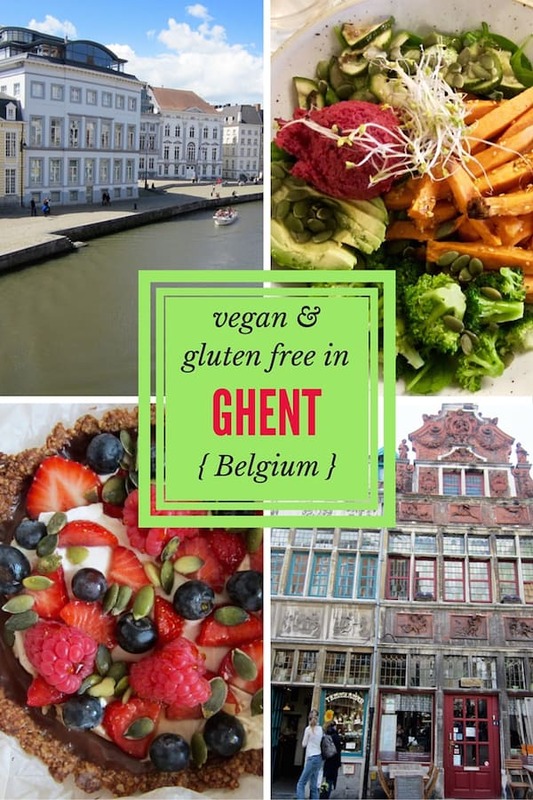 Their menu is clearly labeled for all different types of allergies (gluten, mustard, soy, dry fruits, celery, sesame and peanuts), so I appreciated knowing right away what I could and couldn’t eat without having to ask about what’s gluten free. You know the menu sounds good when you can’t decide what to order, and are pretty sure that whatever you get will be totally amazing. I will admit I was disappointed that they were out of the mushroom ragout, as I had been looking forward to try that based on some reviews I’d seen online. This place has a nice, romantic atmosphere and a tiny little kitchen, located down the steps from the dining room. It’s quite amazing how they pull off what they do! Bon Lloc offers a daily changing 4-course lunch menu (closed on Sundays), and offers dinner only on Thursday, Friday and Saturday nights. I highly recommend that you make a reservation for this place. I called in the morning and got a reservation for that night, so at first I thought maybe I didn’t need it – especially when we arrived at 7:30pm and the place was almost empty. I later realized that we were the typical tourist ‘early birds’, given the late dinner standard in Spain of about 10pm, so by later in the evening it was a full house and we saw people getting turned away at the door. 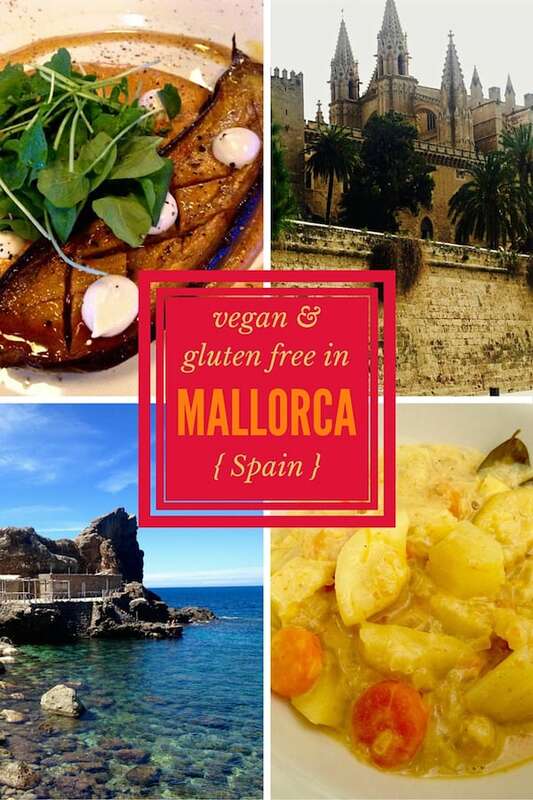 Overall, I definitely recommend this place for it’s character and charming atmosphere, good food, creativity and, of course, that it’s a 100% vegan tapas restaurant. 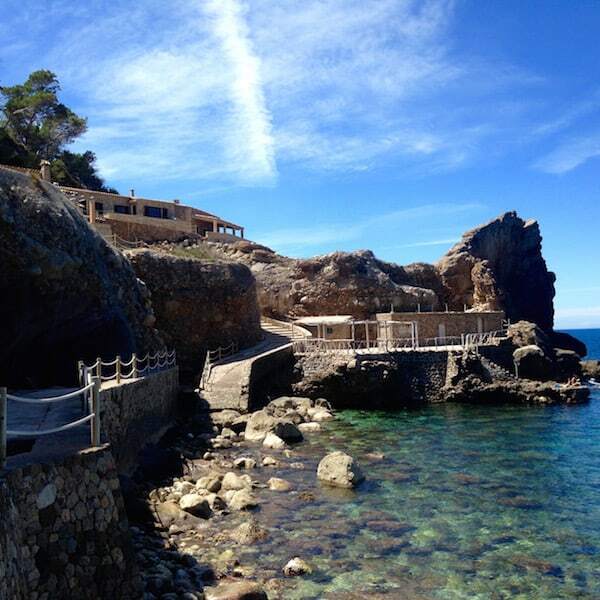 What more could you want in Spain? This basic, local-feeling café is outside the main city center, but still in walking distance depending where you’re staying (it was about a 25 minute walk from our Air B&B apartment). 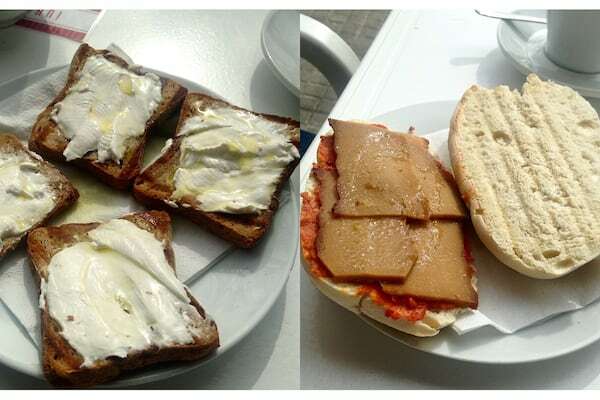 It’s a 100% vegan bakery that also serves lunch, sandwiches, coffee, tea and more, with free wifi too. While it wasn’t totally amazing, Geoff and I still really enjoyed our time here, sitting outside on the patio in the sun and people watching the diverse locals as they strolled by. Our waiter was extremely sweet and friendly, and while his English wasn’t great, we managed to communicate well enough. Let’s talk about this coffee first. I ordered a cappuccino that was good, and Geoff ordered a café con leche which, for whatever reason, was particularly superb and one of the best coffees we’ve tasted. Maybe it was local Spanish coffee? I’m not sure, but we both got a second round. One thing that’s tough as a gluten free vegan is that, once you happen to find a vegan place or vegan selection at a restaurant, many things (like baked goods, breads, and ‘meat’ substitutes) are actually not also gluten free. It makes me sad. I ended up ordering these grilled mini toasts with cream cheese and a sweet-honey like topping. I enjoyed it, even though it was simple. I don’t often eat grilled bread, and hadn’t had vegan cream cheese since I’d left the USA – so it was comforting and pleasing to my palate. Geoff ordered a sandwich with some kind of vegan ‘meat/cold cut’ and tomato sauce. I don’t think he really knew what he was ordering and thought the sandwich would have more on it, so when it arrived he seemed to be slightly disappointed with how barren it looked. Nonetheless, he still enjoyed it and it hit the spot for breakfast that day. According to Dolcos Julia’s Facebook page, they’ve also now added smoothies, juices and slushies to their menu, which they weren’t serving at the time we visited. The café offers lunch as well – toasties, bowls, burritos, pizza, special salads and the like. As we were leaving we saw some kind of veggie bowl at a nearby table, and it looked really great. Overall, while you may not have the best meal of your life here, I still think it’s worth the visit if you’re in the area. 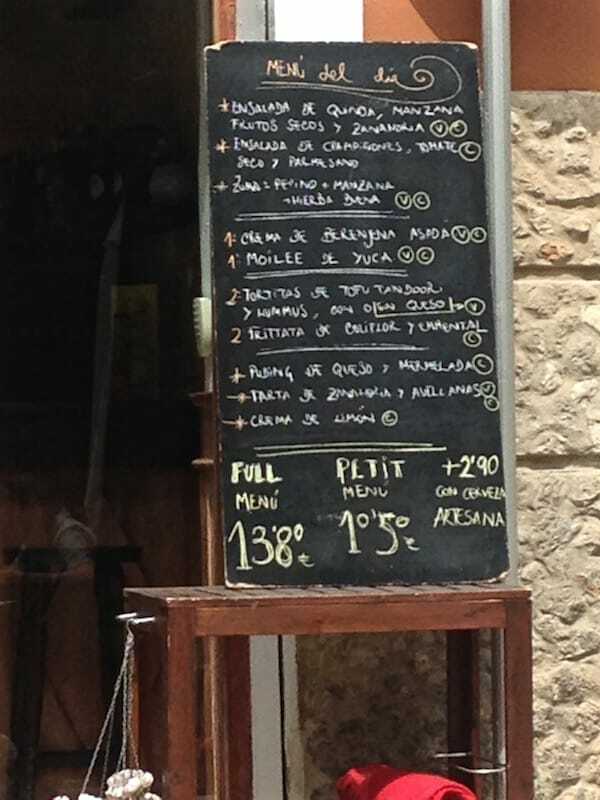 This was my favorite meal in Mallorca (Geoff’s too). My instructors from the cooking course recommended it to me, and funny enough, our apartment happened to literally be in the same square as this little place. In fact, I’d walked by it multiple times (when it was closed) and hadn’t really noticed it, as it’s unassuming and not obvious from the outside what kind of restaurant it is. I was excited to look up the name online and realize that it was right under my nose! We went for lunch and sat in the cute outdoor patio. The menu is all vegetarian, changes daily and is broken down into 4 sections – salad or juice, first course, main course and dessert. 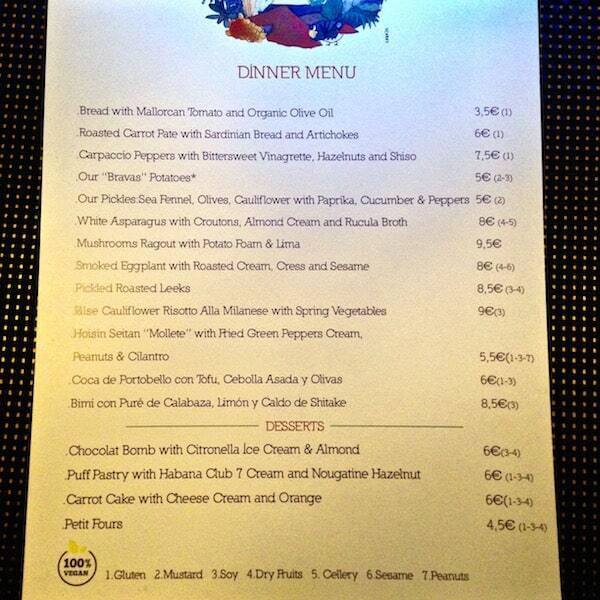 You choose to have either 3 of the courses for €10.50, or 4 courses for €13.80. Is that a deal or what?! I was craving some green juice so started off with the refreshing apple, cucumber and mint juice. We then had moilee de yuca, which was essentially a yummy curry dish made of yuca (which is a tuber similar to potatoes), and some kind of roasted eggplant soup that was downright AH-MAZ-ING. I so wish I had the recipe, because I’d make it all. the. time. Next came the cauliflower frittata. Confession: it had (real) cheese. In my defense, my husband ordered it, but I did try it and have to admit it was extraordinarily delicious. I’d love to create a vegan version of my own. 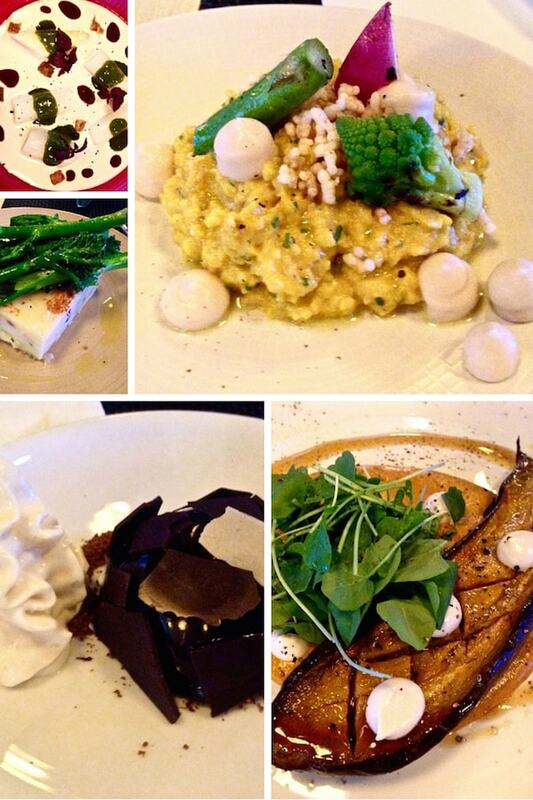 In sum: as a gluten free vegan, finding delicious, local and super affordable food can be challenging at times. The food at Plaer Natural is fresh and flavorful, the servers were friendly, and the menu indicated what was vegan and gluten free. You must check out this spot! This cute little organic grocery store is in the same square as Plaer Natural and has a raw food kitchen. Their display counter is stocked with various takeaway raw foods, both sweet and savory. I got a chocolate chip cookie and a bag of raw crackers, and both were good but I especially enjoyed the crackers (with aromatic spices like turmeric). They also serve organic juices and green smoothies. I would’ve liked to have tried a smoothie or something from their little kitchen, given our apartment was literally above this shop, but ran out of time. This is a chain of markets offering health and organic food products, natural cosmetics, special diet food, and more. We shopped here to get some staples for our stay in Mallorca, as we were being thrify and didn’t want to eat every meal out. Their selection of produce is small but they have quite a range of other natural food products. Crème Crew – Vegan ice cream parlor. Geoff was devastated that we didn’t make it here. Rotana – Lebanese restaurant with vegetarian & vegan options. 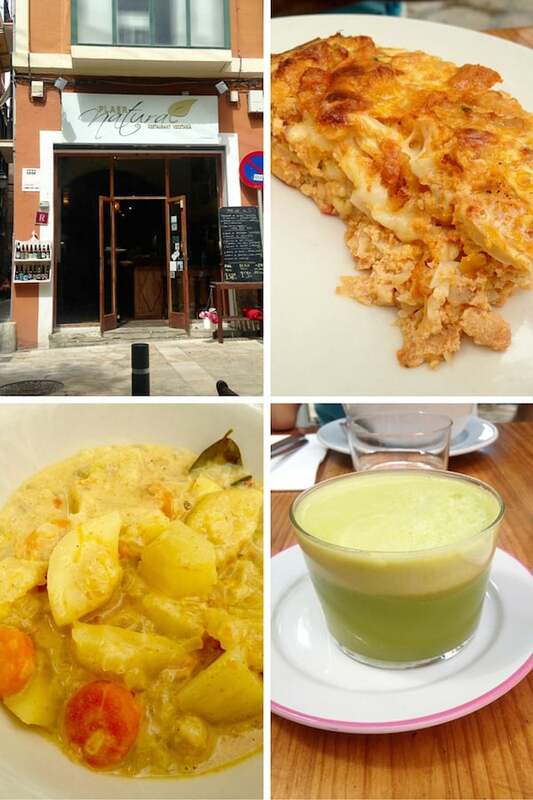 My instructors said to tell them that you’re from the vegan school and that they’d take great care of you, so if you ever make it here, you can tell them that Vegan Gastronomy recommended it! 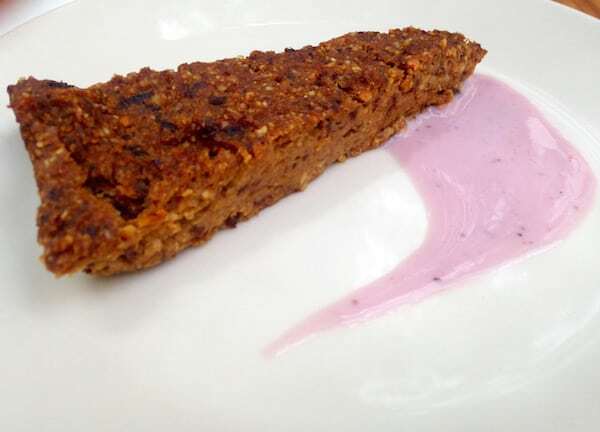 Compost – Organic & vegan restaurant serving breakfast, juices, smoothies, set lunch menu and weekend evening menu. Temple Natura – Local and seasonal vegetarian and vegan restaurant in an urban oasis setting. Additionally, an organic shop is onsite. Did you find this review of Palma helpful? Please leave a comment below! Traveling around Europe? Then you better check out my travel reviews of Ghent, Belgium and Bavaria & Middle Rhine, Germany! So enjoyed your travel report. It would be wonderful to find such amazing food and so many choices while traveling! Makes the idea of going out for a meal fun! I can just imagine the pleasure of not feeling restricted. I do hope I get to visit these places. We have been exploring options for a trip. So happy to see where you have landed Sarah. I have always been a fan.